Cuban bulldozers are digging up an area in front of the US interests section in the capital, Havana. US diplomats say the move is designed to obscure the illuminated messages, mainly on human rights themes, that are being displayed on the building. President Fidel Castro has described the scrolling messages as a gross provocation, saying he believes the US wants to sever all relations with Cuba. The two countries have not had diplomatic links for 45 years. What was once the car park of the US mission in Havana is rapidly turning into a major construction site. Huge cranes have been brought in and teams of builders are working there non-stop. But no-one will say what is being built, not even President Castro. On Wednesday night, his black Mercedes drew up to the site. He emerged to give the workers a pep talk. American envoys in Havana, he said, were cockroaches. Asked what was being built, he said he did not want to ruin the surprise. 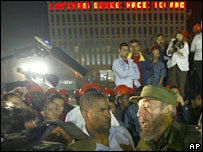 As he spoke, the huge US electronic billboard scrolled out its illuminated messages across the building behind him. One gave news that Palestinians had been voting for the first time in 10 years. Another declared that President Bush believed people had the right to choose how they lived their lives. The propaganda war between the US and Cuba is nothing new - but this is an escalation. Already Cuba has put up scores of posters in the capital caricaturing President Bush as both a fascist and a vampire. Where this will all end is not clear. President Castro says he believes the US is intending to break off all relations with Cuba. He also says he does not believe Cuba would lose much if that happened.